If you’re a regular reader or a real-life friend, you know that a couple of months ago, one of my cats died. 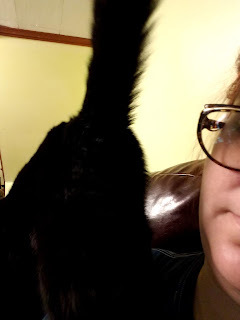 She was a sweet, friendly, affectionate cat who’d only brought herself to start sitting on my lap about five or six months before her death. I buried the body at home, but I wanted to mark it in some way for multiple reasons. 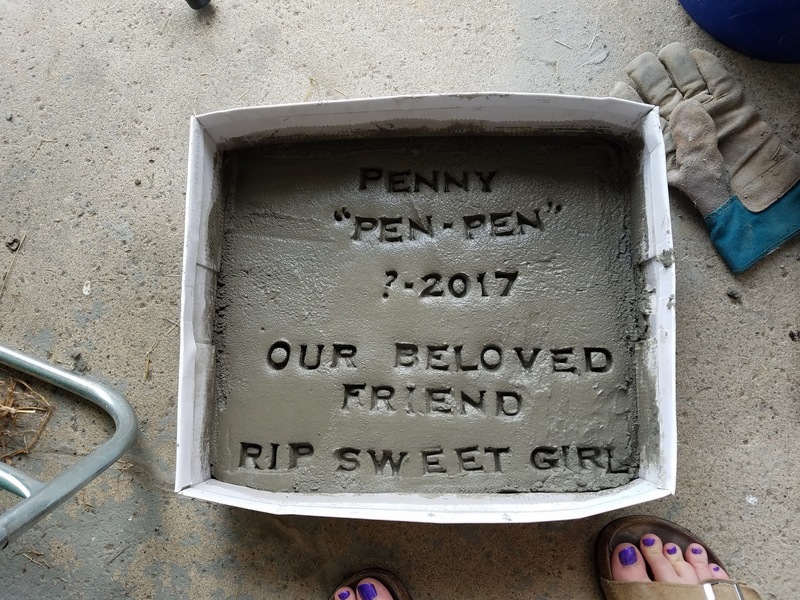 Not only did I want to honor her memory, but I also wanted to remember where I buried her, and, if I end up moving and someone else buys the house, I’ll feel better knowing that they’ll know she’s here and, on a more practical level, that they won’t accidentally dig up a dead cat some day. At first I thought I might buy a pet memorial stone, but they were all expensive, cheap, cheesy, and impersonal. 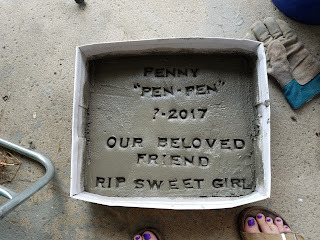 I did some further research and found this blog post by a lady who made her own cat headstone out of quick set mortar and I thought that project just about matched my haphazard DIY skill set, which, as it turns out, it pretty much did. The larger bucket is for mixing the mortar. I added an appropriate amount of mortar before I took the picture, because the bag of mortar lives in the garage. I used the time-honored method of eyeballing it to determine how much mortar I would need. I used this same mortar once before to erect some trellises next to my front porch, so I was familiar with it. 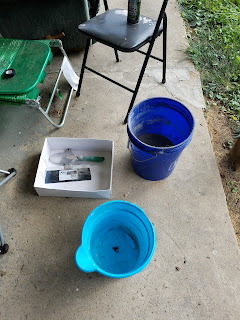 The smaller bucket was for adding water to the mortar mix, because that previous experience taught me that if I try to add water directly from the spigot, I will add too much. The garden trowel was for mixing the mortar, and the taping knife was for smoothing it in the mold; I chose an old shoe box for a mold. None of these were the proper tools, but I made do with what I had. 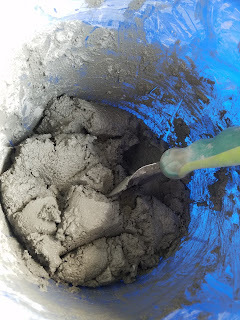 I made sure to buy actual mortar rather than Portland cement, because a previous experience with Portland cement taught me that it will give you chemical burns if you get it on your skin. Thanks to this same experience I also learned that it will be okay if you wash it off quickly enough, but I wasn’t in the mood to take chances. 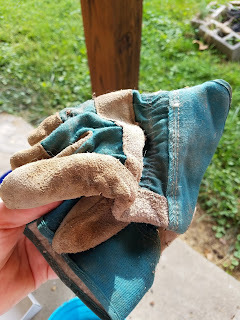 I also wore gloves, but I recommend wearing an old pair of gloves because you will probably get mortar all over them. You should also really wear a face mask while working with the mortar, but I didn’t because they make me feel like I’m being smothered with a hot piece of raw meat. I tried really hard not to breathe in any of the dust. 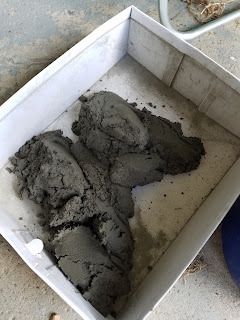 The first step was adding water to the dry mortar mix. 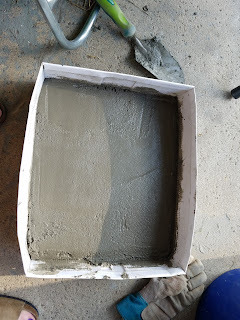 I added too much, so I had to go back down to the garage and add a few more trowels of mortar to get it to the right consistency. It needed to be thick so the letter impressions would hold. While not unbearably strenuous, mixing the mortar was the hardest part. I had to keep scraping the bottom of the bucket to get at clumps of dry mortar that weren’t mixing well. Once it was all mixed, I put it in the mold, then used the trowel to spread it more-or-less evenly over the bottom of the box. 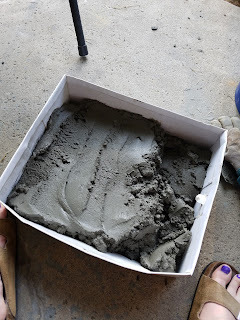 I then used the taping knife to smooth the surface of the mortar. Finally, I used my set of stone stamps to create the inscription. 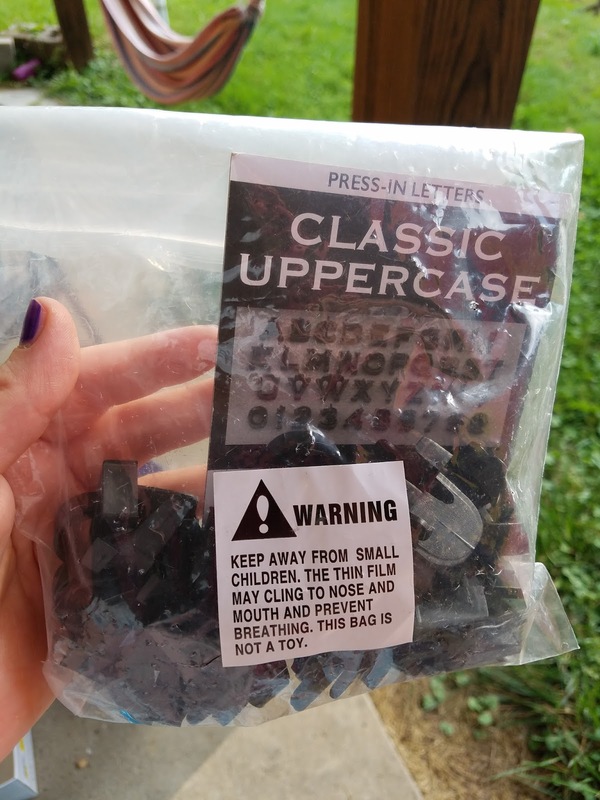 They don’t carry stone stamps at Michael’s, or at least they don’t in my town, so I ordered them on Amazon. After reading several reviews of different sets of stone stamps available, I splurged on a set that has little handles on them so you can more easily press the stamps into the mortar and pull them out. They were about $12, but I figure I’ll be using them again in the future the next time a pet dies. Someday I'll miss this chocolate starfish. At this point, the mortar was starting to set and it became increasingly difficult to press the letters into the surface as I went along. I didn’t really plan the design in any way so it’s pretty crooked. Because the stone stamps came all jumbled up in a bag, I had to spend more time than I would have liked finding the letters I wanted, so I probably should have sorted them out before I began mixing the mortar. I accidentally used an upside-down A instead of a V in “beloved,” but happily, the medium allowed for some mistakes; I was able to refill that letter with a scrap of mortar scraped from the bottom of the mixing bucket and smooth it back out with my finger. I also went a little bit overboard with the inscription, deciding at the last minute to add onto it at the bottom of the stone. All things considered, though, I’m happy with the results. oh thanks for sharing this! my friend's cat gav birth to a new kitten and it passed away i will share this with her as she was very conserned and worried.